What's better than a mobile app update? How about TWO updates? There are new versions of both our iOS and our Android mobile apps waiting anxiously for you to download them. They want to help make classroom management more efficient by enabling some key features from our web platform on your mobile devices. Start updating your iOS or Android app, and I'll run you through the newest enhancements so you can dive right in once it's done. The newest version of our iOS app is all about getting you to the content and information you want faster. Whether that's through speedier load times or better ways to weed through a year's worth of course materials, we've got you covered. 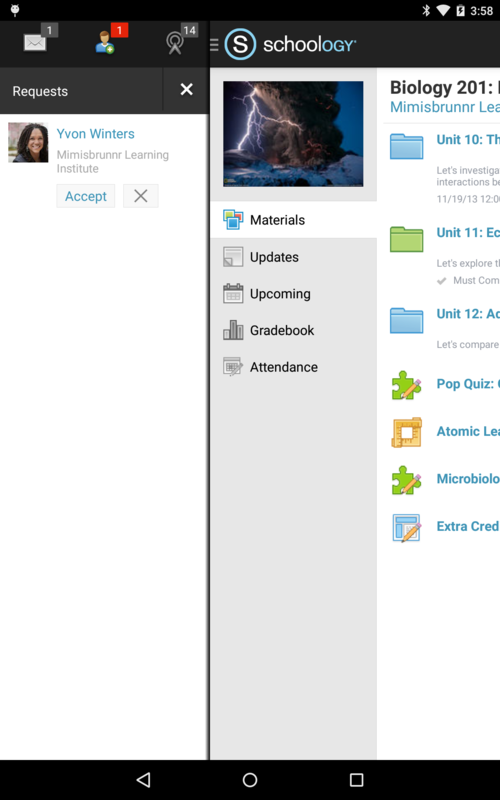 Here's one for both educators and students—you can now filter your course materials by type (e.g., assignments, discussions, etc.) enabling you quickly jump to materials buried deep within your folder structure. Need to find that page on the history of salt production and the spread of the Roman Empire? Filter, scroll, got it. Just remember the importance of effective nomenclature if you want to get the most out of this feature. In this version of our Android app, we've taken steps to align your mobile learning experience more with the experience you have when using the web platform or our iOS app. This simply makes it easier to jump from one device to another or teach in a BYOD or mixed-device setting. As you may have seen over the last few updates, we've been consolidating the access points for your notifications, messages, and requests. Now when you open up your main navigation menu, you have everything at your fingertips. Added by popular demand, Undo and Redo buttons are now available in your annotations panel. You can quickly remove unwanted annotations and add the ones you mistakenly removed back lickity-split. This update also includes some bug fixes and stability improvements. That's it! Your update should be finished, so now it's time to play. Dive in and, if you feel so inclined, let us know what you think right here on the blog, via Twitter (@Schoology), or in an app review. And get ready. We'll be launching new updates before you know it.